"Where was the first organized indoor hockey game played? When did the tradition of engraving winners’ names on the Stanley Cup start? Which six brothers collectively played in more than 5,000 NHL games? 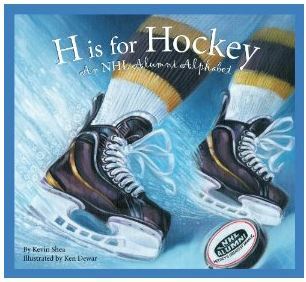 Answers to these questions and many more can be found in H Is for Hockey: A NHL Alumni Alphabet . Formed in 1999, the National Hockey League Alumni Association is affectionately known as “Hockey’s Greatest Family” for good reason. Members of the NHL Alumni are considered hockey ambassadors, supporting the game and its history through many charitable causes and programs. Written by one of the game’s foremost historians in Kevin Shea, this book pays tribute to them and the sport they love. Adding a personal touch are the memorable quotes sprinkled throughout the text. When 17-year-old Sidney Crosby was drafted by the Pittsburgh Penguins in 2005, he said, “This is amazing. It’s been a lot of hard work and a lot of sacrifices. It’s unbelievable!”"
The book is wonderfully illustrated by Ken Dewar. Dewar's work really does steal the show, and will keep kids and parents enthralled time and time again. Shea's simple rhymes to teach children the alphabet are short but sweet. The best part of the book though is the side column information that really is intended for parents more-so than the kids. There is so much to learn, creating much value for readers of any age. The best part of this book is the opportunity it creates for parents to spend time with their children and teach them about Canada's wonderful game and it's glorious history. H is for Hockey: AN NHL Alumni Alphabet gets an A+ from me!